Managers and researchers are coming to realize that Supply Chain Disruptions (SCDs) constitute a real and significant threat – a threat that has to be better understood. However, the challenge facing many researchers is that of developing an understanding of these disruptions, what causes them, what factors moderate or influence the disruptions, and of identifying, and comparing alternative strategies and policies for dealing with such disruptions. This chapter introduces such an approach – computer-based discrete event simulation. Simulation has long been used in Operations Management, Logistics, and Supply Management to study problems such as scheduling (job sequencing, production scheduling, order release, delivery reliability), capacity planning, process design-service, cellular manufacturing, and resource allocation (Shafer and Smunt 2004). 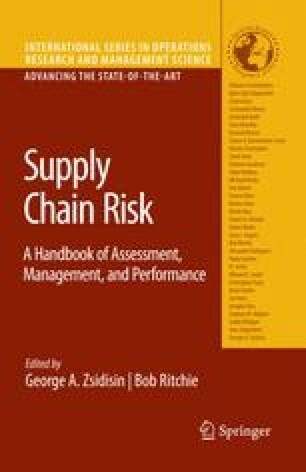 It is now being used as a vehicle for studying supply chain related problems (Bowersox and Closs 1989; Levy 1995; Parlar 1997; Ridall et al. 2000; van der Vorst et al. 2000; Holweg and Bicheno 2002; Shafer and Smunt 2004; Terzi and Cavalieri 2004; Venkateswaran and Son 2004; Allwood and Lee 2005).